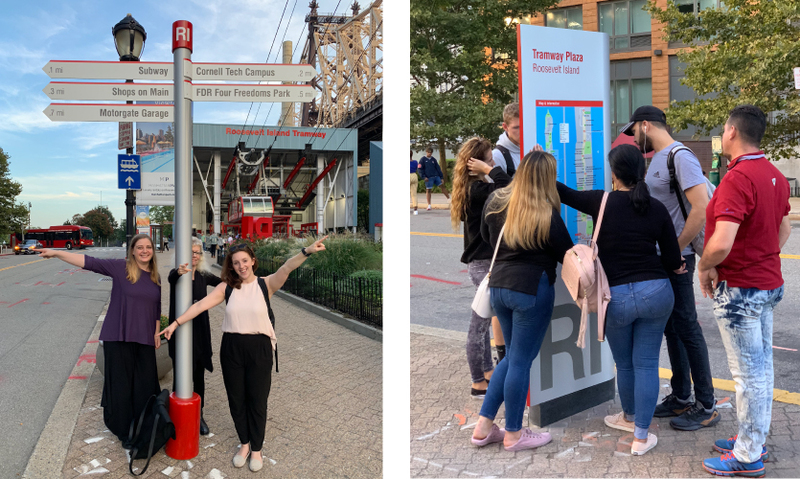 Entro | CVEDesign (New York) joined forces with The Hudson Companies, Inc., the Roosevelt Island Operating Corporation and the local community to provide an enduring wayfinding and placemaking solution for the area’s growing population. The strategically placed and designed system, installed in autumn 2018, consists of three map kiosks, five fingerboard directional signs and a large placemaking element. The design team initially presented several different concepts for it, but the one that users said was truest to the island was also the simplest. The aluminum letters were designed to accommodate interaction with the monument with additional interior support and a heavy granite base. The RI is consistent with the island’s existing and beloved branding: a signature red and Helvetica type are seemingly ubiquitous, appearing noticeably on the street furniture, red buses and Tramway infrastructure. Directional fingers guide visitors to major destinations while offering key information such as distances—clearly communicating the island’s walkability. 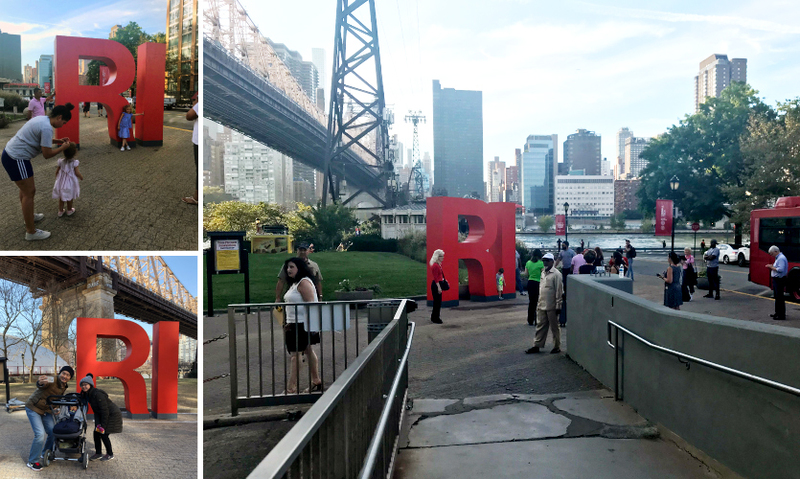 Using color, circles, arcs and typefaces, the design team visually tied the kiosk and finger signs together and linked them to the placemaking element by including the RI letters. The kiosks—placed near the main entry points to RI provide the two views of the island and immediate area, which display key contextual information about restaurants, retailers, residential buildings, public amenities and more. Full-sized mockups were made and tested. 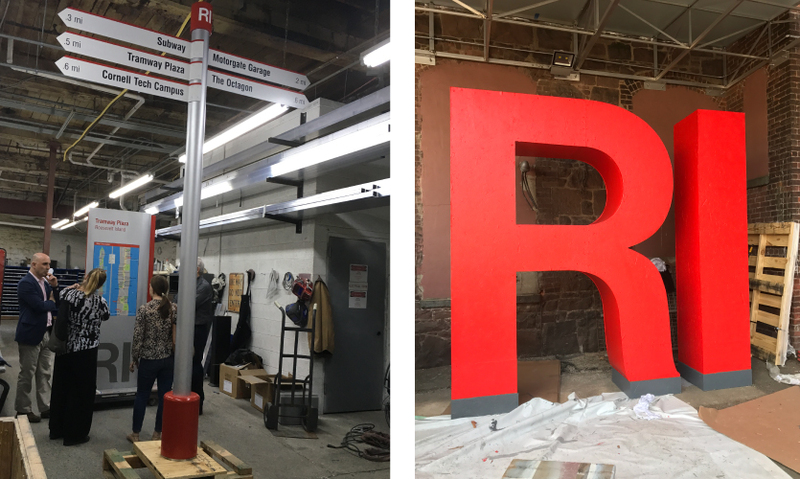 The big red “RI,” was mocked up in wood by fabricator MS Signs and tested in various locations before being officially adopted. Entro | CVEDesign staff, a Hudson Companies representative and others had a little fun at the ribbon cutting. “RI” boasts an interesting history which begins long before it was redeveloped and named after President Franklin D. Roosevelt in 1973: It was privately owned from 1637 until 1828 when the city purchased it, then it served New York mainly as a haven for hospital and prison facilities for over a century. 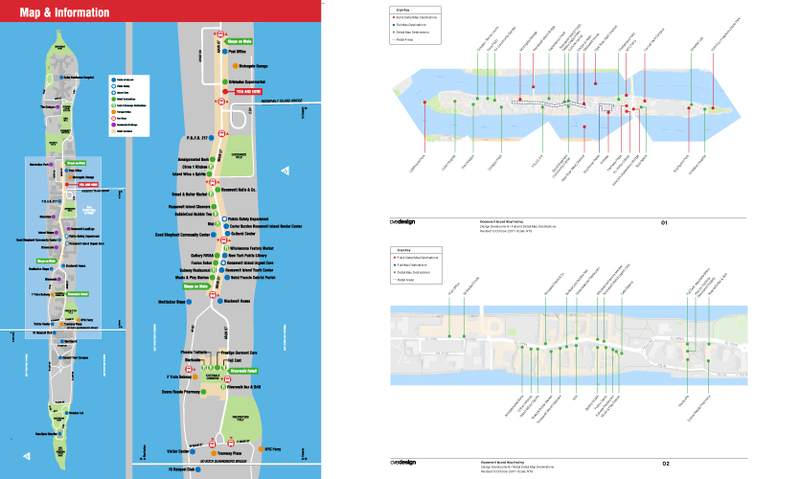 In 1975, planning for Franklin D. Roosevelt Four Freedoms Park started (the Louis Kahn-designed park was completed in 2012) and a year later, Tramway service began as a stopgap as the subway was worked on. 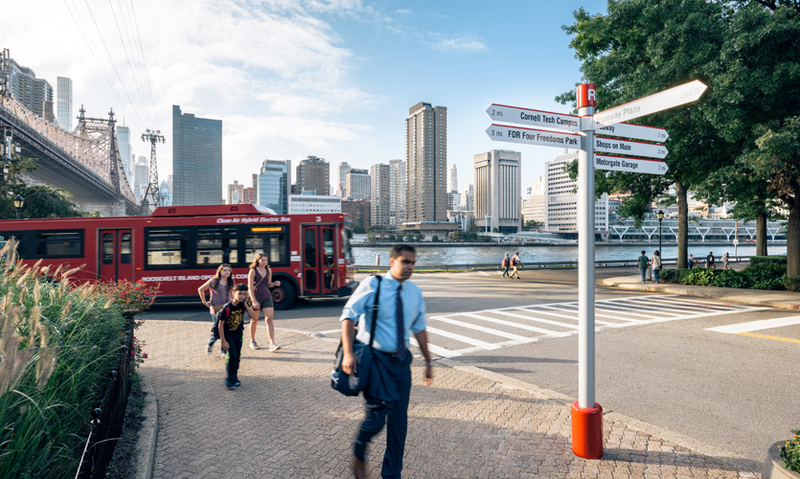 Today, the two-mile-long, 800-foot-wide island is a hotbed for innovation as Cornell Tech—a technology, engineering, law, business and design school that is a partnership of Cornell University and the Technion-Israel Institute of Technology—continues to build its 12-acre campus there. Master-planned by Skidmore, Owings & Merrill and with open space designed by James Corner Field Operations the high-tech green building-filled campus is expected to be complete in 2037 but opened with three buildings and 300 students in 2017. With growing transportation needs, the New York Ferry opened service to the island in August 2017, increasing the ways to reach the island to four: RI Tramway, RI Subway Station via the F Train, the New York City Ferry and by car or MTA Q102 bus over the RI Bridge from Astoria, Queens. (Yet, vehicular traffic remains low due to the Motorgate Garage at the Roosevelt Island Bridge’s terminus and free circulating RI red buses.) The anticipated additional pedestrian traffic to the island underscored a need long felt by the local community for a wayfinding system. The Hudson Companies, a residential and retail developer with properties on the island (including a Passive House residential high rise on the Cornell Tech campus), championed the project—along with participation from the Roosevelt Island Operating Corporation and the residents and workers of RI—bringing in frequent collaborator CVE Design (now part of Entro) to find a solution. 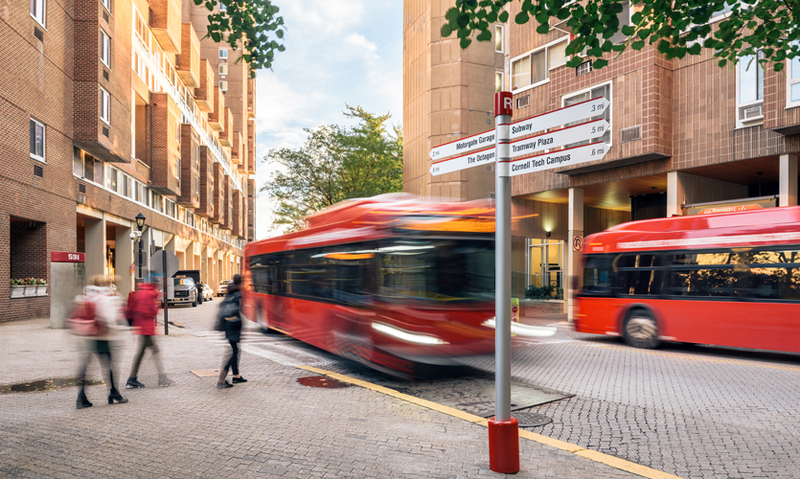 The design team was tasked with solving a three-fold problem—creating a welcoming, engaging arrival experience, enhancing pedestrian wayfinding and increasing retail visibility on the island—with two audiences, locals and visitors. 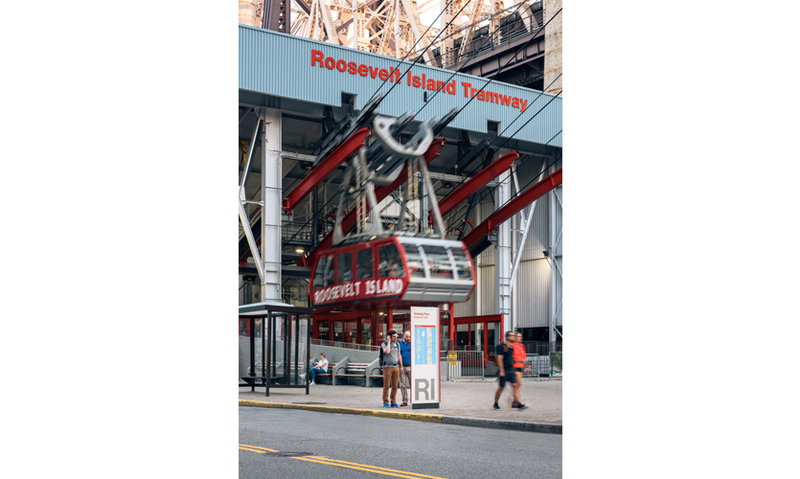 Often, tourists took the tram to the island and immediately returned to Manhattan, unaware of the island’s features or walkability. One of the project’s key aims was to entice visitors to stay and explore. The leadership commitment displayed by The Hudson Companies and RIOC in building consensus and support for the program was vital to its success through phase one’s two-year process and large stakeholder group. Additionally, The Hudson Companies agreed to handle implementation and RIOC maintenance of the system. 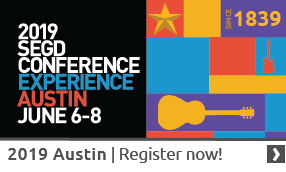 “Strong sponsor leadership and support is essential for the success of civic wayfinding programs—something we learned while designing the blue wayfinding signage for Washington, DC,” explains Chris Calori, principal at Entro | CVEDesign. “The designer is only part of the team needed to bring projects like this to fruition.” Calori believes transparency on the entire project team’s behalf is necessary—especially for designers, since design is a mysterious process to many. In their research, the team took photo surveys, observed wayfinding behaviors, studied maps and walked the island in addition to gathering information from RIOC, The Hudson Companies and the community. Meetings with the stakeholder group and feedback from locals was key in determining the ultimate visual direction and language of the wayfinding system and placemaking elements. 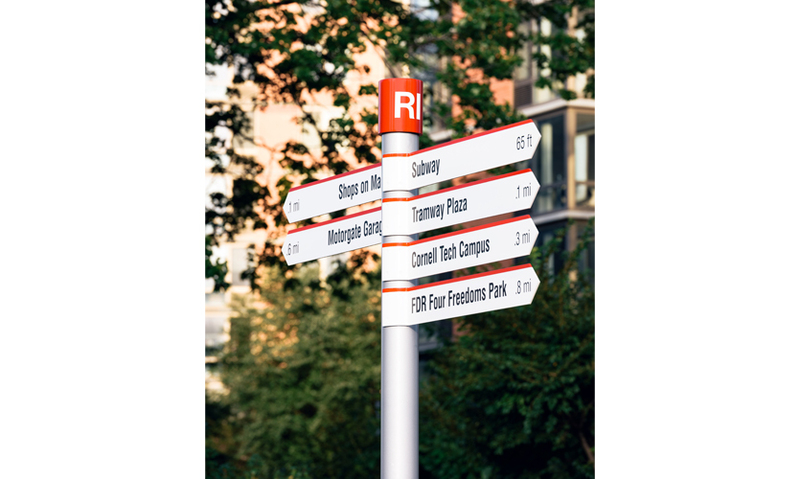 “For a very long time the community had wanted a wayfinding system, so they had a lot to say about what should be on the map and what would be useful for them, but the biggest conversation revolved around the placemaking icon,” remembers Schrader. 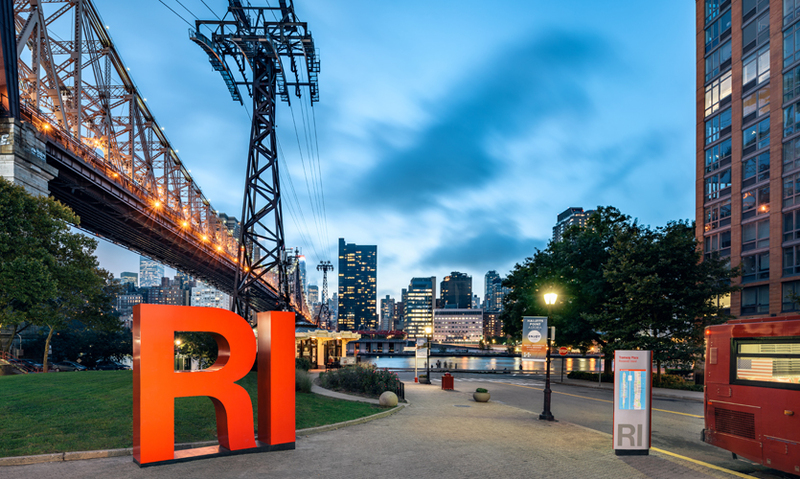 The Entro team initially presented several different concepts for it, but the one that users said was truest to the island was also the simplest: a big red “RI,” which was mocked up in wood by fabricator MS Signs and tested in various locations before being officially adopted. The monumental red placemaking RI anchors the program by heralding arrival at the Tramway Plaza. It’s the first part of the experience, welcoming and further serving to activate the space, engage visitors and generate activity. 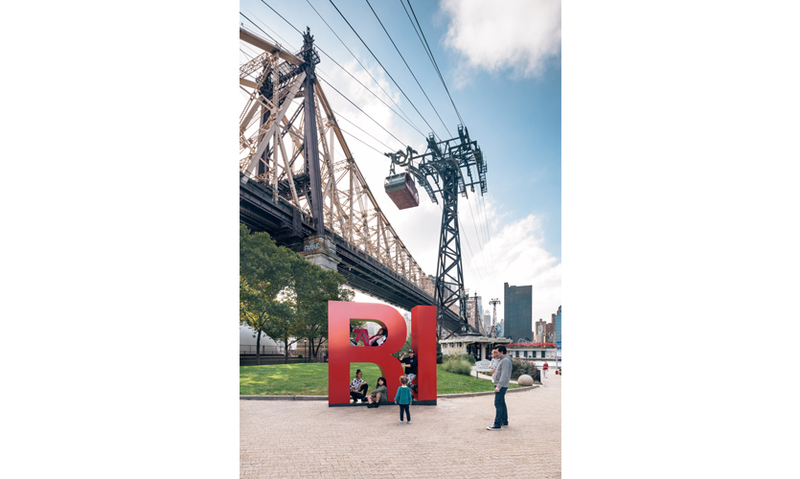 “By putting the RI in this large plaza with the backdrop of the Queensboro Bridge and the Tram, it becomes this iconic moment that captures the spirit of the island,” muses Calori. “Thinking about placemaking as something that people physically interact with in addition to a social media backdrop allowed us to further a sense of community as well.” The aluminum letters were designed to accommodate interaction with the monument with additional interior support and a heavy granite base. 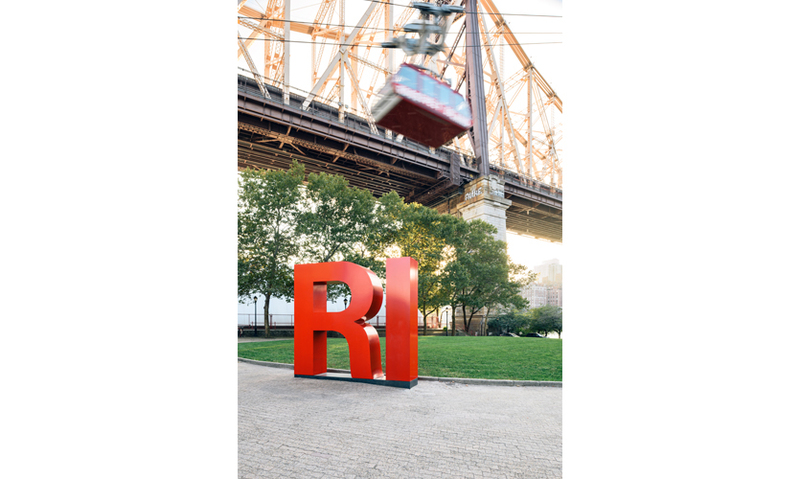 The RI is consistent with the island’s existing and beloved branding: a signature red and Helvetica type are seemingly ubiquitous, appearing noticeably on the street furniture, red buses and Tramway infrastructure. The design team embraced the existing color and typeface, using a condensed form for longer text and branding using RI on all of the system’s elements, with a goal of integrating their design to make it feel as if it’s always been there. There was some challenge in making the system compatible with its diverse surroundings yet distinctive enough to visually unify and brand the island, but the biggest challenge lay in the maps. Designing maps, while never easy, poses a serious challenge when they come with a long list of destinations. The design team began by working with the client to come up with every destination on the island, taking that enormous list to the other stakeholders to determine what was most important. Over a period of months, they were able to narrow and negotiate it down to about 14 key locations, before being given the supplementary challenge of using the maps to promote retail on the island. At this point, the help of experts at Eureka Cartography was especially welcome in creating GIS-level accuracy in the static maps—one full-island and one detail—while adhering to a more diagrammatic style. The maps also needed to be updateable and changeable because of the nature of retail business, so the Entro | CVEDesign team devised a simple system using a digitally-printed high-pressure laminate panel that can be unscrewed for replacement. 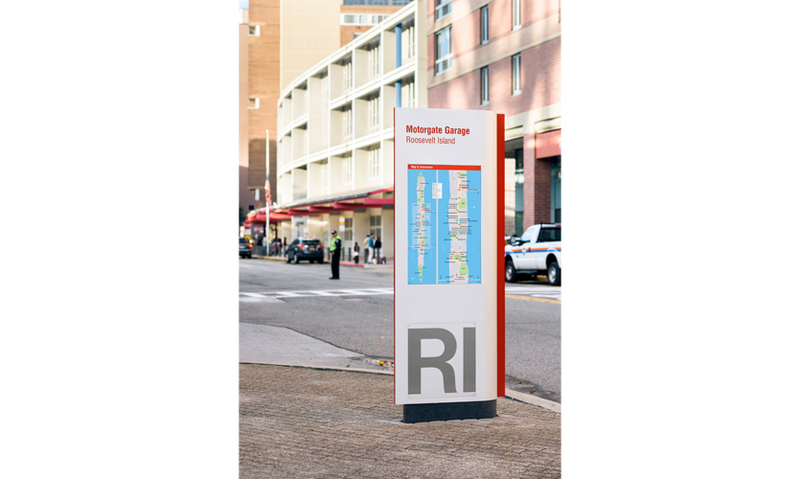 The kiosks—placed near the main entry points to RI provide the two views of the island and display key contextual information about restaurants, retailers, residential buildings, public amenities and more. Typical environmental conditions such as sun, rain, snow, temperature changes as well as vandalism were taken into account when designing the subtly red-striped kiosks and an analog solution was chosen after a fairly substantial study of electronic display screens came to the conclusion that in addition to outdoor suitability, factors like high initial investment and short lifespans outweighed the ease of updating that flat screens could provide.